Ms. Chase shared that she spends a lot of time thinking about the use of excess capacity and believes that this is a fertile area for innovation. 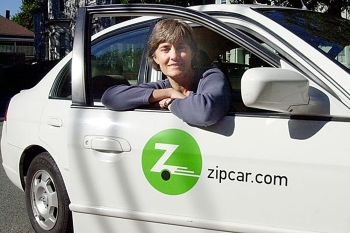 She provided several examples of companies that have been built around this concept, including Skype and Buzzcar.Using Skype as an example, she noted how the company used computers, webcams, microphones, and Internet access that its users have already bought and paid for to build a telecom company cheaply from scratch. She contrasted that with building a “standard” telecom company in which the company would have to supply all those elements itself. Similarly, she spoke about how Amazon, which had excess computing capacity that it only used once a year for the Christmas rush, sold the excess for cloud computing during the remainder of the year. She challenged universities and governments to think about what under-utilized assets they have, and how those assets could be made available for use by others. I asked Ms. Chase why we should care about excess capacity. She replied that there were at least two reasons: sustainability and larger return on investment on items already purchased. She also noted that using the lowest cost resource more, or more efficiently, is gratifying, not to mention economically sensible. She explained how limited smart phones were when locked. Once they were unlocked, the phones became platforms that are being used in multiple ways. Regarding advice about entrepreneurship, she said that it is important to have a location (physical or virtual) for entrepreneurs to meet different types of people to facilitate collaboration. This is vitally important as entrepreneurs have different needs and are not just looking for sources of funding. Ms. Chase surprised me when she suggested that your school years are a great time to start a company. Every entrepreneur needs more cash, she remarked, so being a cash-poor student is not an additional disadvantage: a student is free of the constraints of a 9-to-5 job, has health insurance, and thus can afford to take chances. As we wrapped up the conversation, Ms. Chase, who currently lives in France, discussed how America can maintain its leadership in innovation and entrepreneurship. She noted that we have many advantages here in the United States—for example, the ability to hire people easily and temporarily, the ability to do multi-disciplinary things, a business-friendly tax environment, etc.—when compared to France, where children are focused on one career path very early and it is difficult to hire people on a temporary basis. However, because U.S. health insurance is tied to employment, according to Ms. Chase, it is very difficult for mid-career working professionals to leave their jobs and become entrepreneurs for fear of losing their coverage. For an entrepreneur, the ability to fail is important and failure itself is an important learning experience. This was a dynamic and lively exchange. Ms. Chase is a transportation pioneer who lectures widely, has been frequently featured in the major media, and has received recognition and awards in the areas of innovation, design, and environment, including being named by Time Magazine as one of the 100 Most Influential People, one of Fast Company’s Fast 50 Innovators, and BusinessWeek’s Top 10 Designers. Ms. Chase graduated from Wellesley College and MIT's Sloan School of Management, and was a Harvard University Loeb Fellow.